Controlling your heating manually is neither cost effective nor energy efficient. This can be rectified with the help of a smart thermostat like the Eve Thermo. 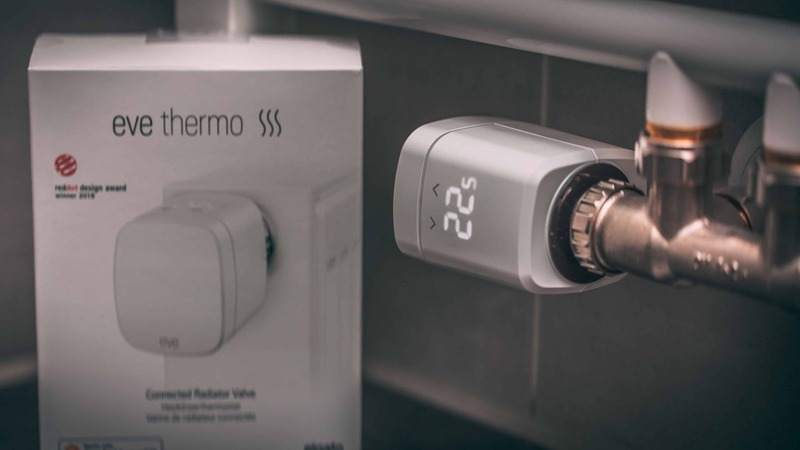 This Review shows you, how easy it is to replace your old TRV with a Eve Thermo and what the benefits of a smart thermostat are. You may be wondering why you should consider replacing your old manual thermostats (TRVs) with a smart thermostat. Actually there are a ton of reasons to do that. Lets take your bathroom for example. If you want to have a shower in the morning you’ll need to turn on the heating in the evening so the bathroom is nice and comfy in the morning. The hours between bedtime and showering in the morning are wasted energy. Why not just turn on the heating half an hour before you shower? You can do this with the help of Eve Thermo. One of the biggest advantages of the Eve Thermo is the possibility to schedule your heating according to your daily routines. Let’s say you getting up at 06:30 in the morning and you are starting your day with the mentioned shower. Eve Thermo is able to preheat your shower from let’s say 06:00 o’clock. Whit this action alone you probably are saving 7 hours of heating and wasted energy in the night. But why stop there? You can set your scheduling to stop heating at 07:30 and resume heating at 18:30 o’clock so it’s nice and comfy when you come home from work. So here you are saving another 10 hours of unnecessary heating. I know a lot of people think of TRVs as mystical creatures and are therefore afraid to replace them. The good thing is, it’s not as dangerous and complicated as my may think. In order to replace your old thermostat with the Eve Thermo, you need access to the securing ring of the TRV. This ring connects your TRV with your radiator. To make the removal easier, set your TRV to the highest possible setting. Now now you can loosen the securing ring by turning it counterclockwise either by hand or if necessary with the help of a wrench. After you removed your old TRV, you can now continue by installing your smart thermostat. This is pretty easy, since you are being guided through the whole installation process on the Eve App. As a results you now need to install the new thermostat, but be aware, in some cases this only can be done with the help of the adapters that are coming with the eve Thermo. After you screwed the Eve Thermo into place, it’s time to calibrate it. Otherwise the thermostat won’t be able to tell, at which position the heating is turned on or off. For this reason, you have to repeated this calibration every time you are switching to another radiator. Investing in smart thermostats can be pricey depending on the amount of radiators you have, but consider this. You are saving money every time your heating is turned off, when it normally would be on. Therefore thermostats like Eve Thermo are paying for themselves. The more and longer you utilise the features of such thermostats, the higher your return of invest will be. In the end you are not only saving a huge amount on your heating bill, you are also doing your part of saving the environment.